The Chapel Hill Zen Center, in the Spring of 1991, asked the Abbots of the S.F. 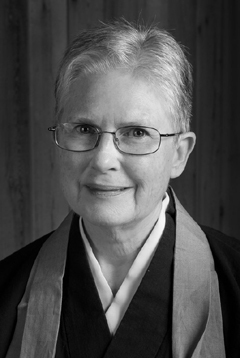 Zen Center to send Taitaku Josho Patricia Phelan to lead the group. Pat was ordained in 1977 by the former Abbot of the San Francisco Zen Center, Zentatsu Richard Baker, who was Suzuki Roshi's successor. She has also studied with two of Suzuki Roshi's other disciples, Sojun Mel Weitsman and Tenshin Reb Anderson. Pat began sitting zazen in Oregon in 1969. She moved to San Francisco in 1971 and spent several years at Tassajara Zen Mountain Center. Prior to her arrival in Chapel Hill in August, 1991, she was a Practice Leader and Director of Zen Center's residence facility in San Francisco. In the Fall of 1995, she returned to Tassajara and completed her training by receiving Dharma Transmission from Abbot Sojun Weitsman. In October, 2000, Josho Sensei was officially installed as Abbess of the Chapel Hill Zen Center. In December, 2008, Josho Sensei traveled to Japan to participate in Zuise ceremonies at Eihei-ji and Soji-ji temples. She is married and has a daughter.